This unusual and interesting name is an English occupational (job-descriptive) surname for a "roofer, a tiler or thatcher". 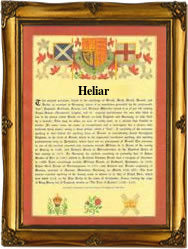 The derivation is from the Old English pre 7th Century word "helian", meaning "to cover", in Middle English "hele(a)". The name development has included "Gilbert le Helyere" (1280, Hampshire), Robert le Hillier (1347, Bedfordshire) and one "Walter Helier or Tiler", (1450, London). In the modern idiom the surname can be found in at least nine different forms "Heliar, Hellier, Hellyer, Helyer, Hilliar, Hillier, Hillyar, Hillyer and Hilyer". On June 7th 1629, Nathaniel, son of Edmund and Judith Hillier, was christened at St. Martin-in-the-Fields, London, and Grace Hillier married Nathaniel Briggs, on August 23rd 1656, at St. Gregory by St. Paul, London. A famous namebearer was George Hillier (1815 - 1866), a topographer, his published works include "Topography of the Isle of Wight" (1850), and a guide to Reading (1859). The first recorded spelling of the family name is shown to be that of Robert le Heliere, which was dated 1275, in the Hundred Rolls of Kent, during the reign of King Edward 1, known as "The Hammer of the Scots", 1272 - 1307. Surnames became necessary when governments introduced personal taxation. In England this was known as Poll Tax. Throughout the centuries, surnames in every country have continued to "develop" often leading to astonishing variants of the original spelling.